Brodie Blog: A sniff of the ocean !! We have made it to the Southern Ocean. From Queenstown we joined the Greenstone Track which was absolute bliss and we had a great night in the Greenstone Hut which ended up being very busy with all but 1 bed spare. So many trampers. It was lovely to socialise and thank god for ear plugs! 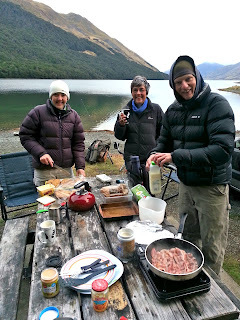 We soon were on our own again when we headed south down the Upper Mavora valley passing through the Taipo and Boundary Huts before staying in Careys hut which is magnificently located on the shores of the North Mavora Lake. We thought Boundary Hut could be called that as it was possibly the border of Otago and Southland? In Careys Hut this was my moment to try the Back Country Mouse Trap explained to me by that wily old kiwi backcountry man and mouse killer Bill Clarkson. So you fill a large bucket with water. Place it underneath the neck of a wine bottle which is balanced on a table or chair. In the end of the bottle place a bit of cheese about 2cms down the neck. Vigorously smother the end of the bottle with something very slippy like cooking oil or similar. So all set. Mouse smells the cheese, mouse skips along bottle very inquisitive, mouse just can't resist going out along neck of bottle .......just wait for the splash. Yee ha. I caught 3 mice that night. I never thought I would turn into a hunter but this trip certainly has been a life changer!!. There is something very satisfying about hearing another plop in the wee small hours. Man versus Nature? So much for 10 pointers I had a 3 tailer. Bacon sizzling in the pan, luxury!!! Down the beautiful Movora Valley to be met by Dave, Kirsty, Crockett the dog and our Camper Van. We had 2 lovely frosty nights camped here with the gang. It was great being supported by these guys which allowed us to pack in some big days with light packs. On our first night with them Kirstys friend Rachel showed up and dished up a wonderful Spag Bol and gave me lots of meat as she thought I was turning into a vegetarian. Great nights, great company and many memories. Dave's cooking skills proved much better than his fishing skills - bacon butties yum yum. After a quick dash to Te Anau for a weather update and resupply Dave and Kirsty dropped us at the start of the Lower Princhester Track which is the start of the traverse of the Takitimus. We did get chance to sample a pie in Te Anau. Yummy. 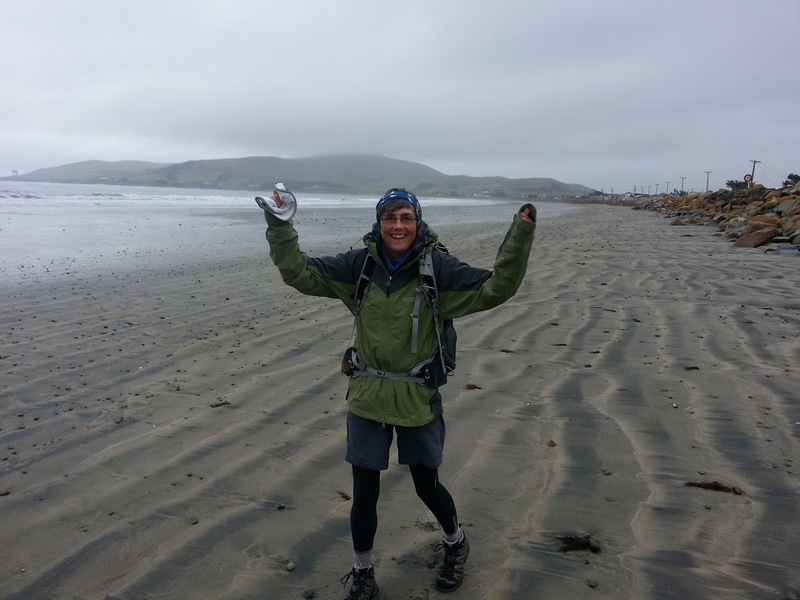 Takitimus are pretty special as well and we stayed at the Aparima and Lower Wairaki Huts. The night we were in the Lower Wairaki Hut it pelted it down with rain for most of the night however by morning it had eased off but this was the signal that things were about to change meteorologically!! Just want to mention two very interesting near misses. I took a face plant in a river when a rock I stood on completely flipped and I went completely under head to toe. Miraculously no injuries!! Lynne took a tumble and face planted a bed of moss and lay motionless for what seemed an age as her hands were under her and her pack holding her down. Lynne not so lucky as me and twisted her ankle but managed to hobble on. I keep her going with a cattle prod. No seriously she has been a real trooper and soldiered on. You eventually pop out of the Takitimus at Mt Linton Station followed by 12k walk on a magnificent 4wd track through this wonderful high country station and past the Rock Hut, and a memorial to a guy called Duggie who worked at the station for 40 years as a digger driver and musterer. Looking back at the Takitimus. We stayed in Ohai in the old Pub which was closed as a pub but the family took in Te Araroa trampers as there is no where else in the village to stay. What a backwater Ohai is. Property is certainly cheap but sad to see all the mines shut bar a few. We rested up there for a day. That particular day most of the village were attending a funeral which started at 10am. By 12 everyone seemed to be in the Fire Brigade HQ drinking and stayed there most of the day. At Ohai and for the first time on the whole trip we were staring down the barrel of a pretty miserable forecast so we made the big call to stay off the tops in the Longwood Forest section and walk the backroads to Colac Bay. We are very glad we did as the bad weather has set in and we are over the moon now to be by the sea. We have been dreaming about this and are really looking forward to next few days especially tomorrow with our 27k walk along Oreti Beach and hopefully as well as the roar of the ocean we might hear the roar of Burt Munroes Fastest Indian. Thanks once again to Dave and Kirsty for moving our van on to Colac. Too cold to surf !! We hope to be in Bluff on Sunday. Yabba Dabba Doo! We just can't believe we are here and we are going to make it. Not sure we want it to end. Thanks to everyone that has helped and contributed to our journey and fundraiser. $5600 at the moment. Would love to get it up to $6000 if we can. The next Blogupdate will be the biggie. Keep your fingers crossed. To donate now to Cancer Research click on this link ..... Donate to Cancer Research.